Never need to buy celery again? Sounds good, and simple; After using your organic celery for whatever dish (we recommend our Hunter's Stew), don't throw away the base - plant it and re-grow a new celery bunch, indoors or out. First, place your celery base-down (cut part up) in a small dish of warm water on or near a sunny windowsill for about a week until small green/yellow leaves appear in the centre. 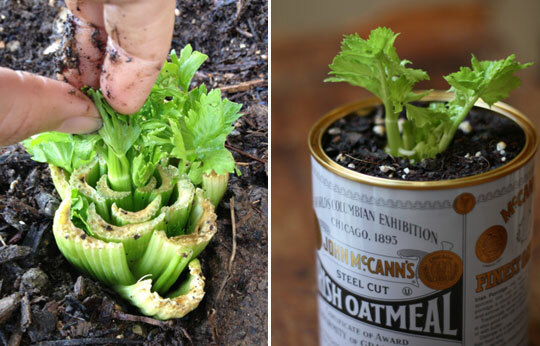 Once they fully emerge you can plant your celery. If you have space outdoors where sunlight and drainage are accessible, the celery should thrive there - if not, a re-purposed steel container will make a fine indoor bed for your bunch. Cover all but the newly emerged leaves with soil, and water generously. After a few weeks, you will see distinctive celery stalks ready to use!